These commercial quality tabletops and bar height bases provide a strong, attractive, highly durable, no maintenance alternative from high-priced dining sets. 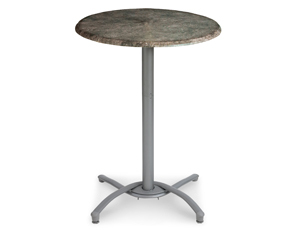 Specifically designed for the indoor/outdoor food service and hospitality industries, these environmentally friendly tables are naturally impervious to salt air and chlorine. They won't rust, fade, chip or stain. They are heat, burn, weather, stain and scratch resistant. Cleans easily with soap and water. Available in square or round and a variety of color options. Heavy-Duty silver gray or black powder-coated aluminum construction base for weather resistance and structural integrity. Two adjustable leg levelers balance table base on uneven surfaces. Easy to secure with metal chain and padlock for storage. 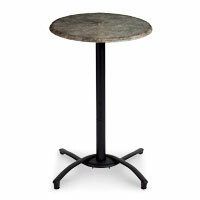 This bar height table base has a 33" diagonal footprint. Measures 41-1/4"H.